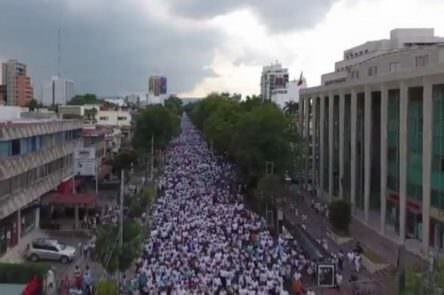 An estimated 40,000 people marched in the city of Queretaro, organizers said. Jose Alcantara, an organizer with the National Front for the Family, said they had gathered more than 100,000 signatures against the proposal. “I think it was something unprecedented, the awakening of the society of Queretaro in defense of the family,” he said. In Monterrey, counter protesters sang and read poetry to show support to the Mexican gay community. “It’s a discriminatory position and we hope it doesn’t have success,” Jesus Gonzalez, a human rights activist, said to Voice of America. Ary Campos Martinez, a representative for Civil Protection in the city of Puebla in central Mexico, said officers were monitoring a crowd of approximately 12,000 by midday.